TAJ MAHAL: An artist's sketch of M. W. Savage's main stable at his famous horse breeding farm at Savage, just a few miles south of Minneapolis. The octagon center was 90 feet in diameter, and each wing was 157 feet long with 130 heated box stalls. Beyond the stables was a mile track, and to the left, was a completely enclosed half-mile track with 8400 windows. A part of the stables burned in 1917 and the enclosed track was wrecked soon after. CREDITS: Author Robert Warn is a designer with the Northfield firm of architects, Sovik, Mathre and Madson. He is an authority on Rice county history and vice-president of the Rice County Historical Society. Some of the materials for this story are used by courtesy of the Minneapolis Public Library, Historical Division. COMMUNITY LEADERS such as John W. North, founder of Northfield, and General James Shields, founder of Shieldsville, and many others, fought to bring railroads into this rich Minnesota valley by the mid-1860s. But by the 1870s and 80s farmers and town folk had grown hostile to the railroads due to high shipping rates and other issues. However, by the turn of the century this great Populist movement had subsided, and then M.W. Savage announced plans in 1907 for a new railroad to serve southern Minnesota, urban and rural residents alike joined in welcoming the proposal. This railroad was named — ambitiously — the Minneapolis, St. Paul, Rochester and Dubuque Electric Traction Company. It was popularly called The Dan Patch Line. It was a famous horse that gave his name to the new railroad. Perhaps that is why it captured the imagination of both farmers and townsfolk alike. Both had a great deal to do with horses at the turn of the century. 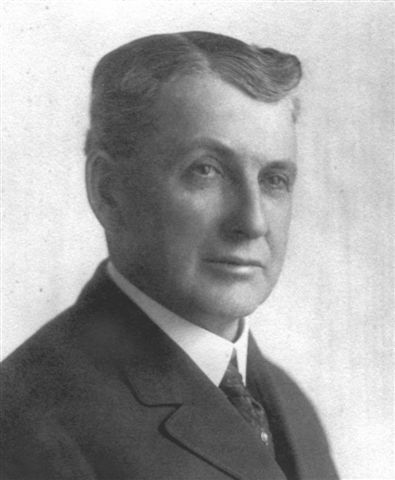 Promotion wizard Marion Willis Savage, called by his contemporaries "the second P.T, Barnum", made the name Dan Patch a household word. The son of a country doctor, Will was born in 1859 in Ohio, but grew up in West Liberty, Iowa. His lifelong fascination with horses began when he was a driver on Dr. Savage's sick calls. His early skill with horses was saluted by an Iowa liveryman: "I'd trust that kid with our most spirited horses, day or night." (Savage's story is told in Fred A. Sasse's colorful "The Dan Patch Story"). M.W. Savage married in 1881 and was an Iowa farmer until the floods ruined his crops. However, his real career was begun when he began clerking in a West Liberty drug store. Observing the local farmers stock food and drug purchases, Will decided to manufacture the supplies himself. He formed a partnership with a supposed friend who soon made off with their funds, leaving 27 year old Will Savage almost penniless. So in 1886 Savage sought a new start in Minnesota. Minneapolis had become the center of expanding dairy, farming and livestock industries. Also in the Twin Cities could be found experts (including feed chemists) at the State Agriculture College and experiment stations. Starting in a small stock food manufacturing plant and utilizing the local scientists, he startled the business community in a few years with the purchase of the huge Exposition Building on the river in Minneapolis. There he centered his International Stock Food company which soon had affiliated plants in Toronto and in Memphis, and overseas in Scotland, Ireland, England, France, Germany and even in Czarist Russia! In Europe, as in America, Savage drummed into farmers' awareness his catchy slogan, "Three feeds for one cent." With his growing wealth, and to satisfy a long cherished ambition to breed champion horses. Will Savage purchased (in about 1895) 750 acres of choice farmland 18 miles southwest of Minneapolis on the Minnesota River near Hamilton — later renamed Savage in his honor. On his estate he built extensive stables, two race tracks (one completely enclosed!) and began buying race horses. Among them was Dan Patch. That name came to mean, as Sasse reports, "the epitome of excellence, the superlative of greatness, the zenith of equine superiority." This in a day when to all Americans the horse was king. Named with the first name of his first owner and the last name of his sire (Joe Patchen), the famed horse was foaled in 1896 in Indiana. He began his racing career as a four year old in 1900. Praised for his calm, noble spirit, and gentleness, as well as his racing potential, the pacer was acquired in 1902 by Savage who said, "Dan Patch at $60,000 was the cheapest horse I ever bought and he has paid for himself inside three years and could not be purchased of me for $180,000, which I was offered." Dan's previous owner had paid $20,000 for him in 1901, and no other pacer had brought half the $60,000 paid by Savage. Dan Patch had become such a consistent winner in this country and in Canada that after 1902 no other stables would race their horses against the big mahogany bay stallion. So the sportsman who was to sell Dan to Mr. Savage decided in Mr. Sasse's words "to put Dan's leg muscles against the unbeatable phantom horse —the watch. There was nothing else to do". Dan Patch's career peaked during the racing seasons of 1905-1906. At Lexington, Kentucky, on October 5, 1905, he set his fastest officially recognized mile record. The local paper commented on the horse's pacing of the mile in the sensational time of 1 minute and 55 1/4 seconds: "Never before in the annals of light harness achievement has such magic speed been attained on any track, and deep was the impression made on those who witnessed it." At the Minnesota State Fair track on September 8, 1906, before an enthusiastic crowd of over 90,000 people Dan Patch made harness horse history. He paced the mile in the fastest time of his career at the previously unheard of time of 1:55. Crowds welcomed Dan in downtown Minneapolis and a jubilant M.W. 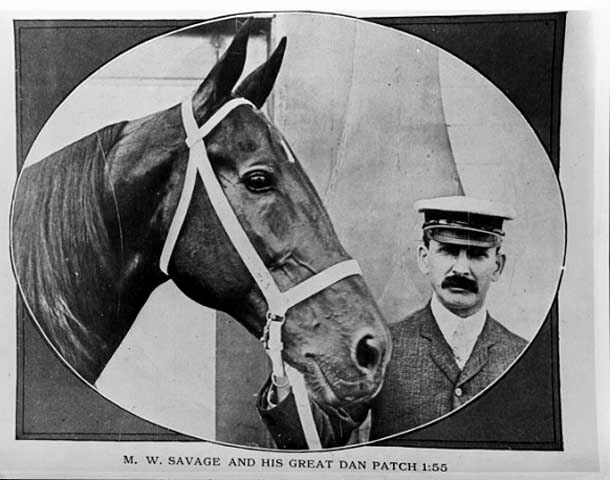 Savage, always the showman, renamed his firm as the Dan Patch 1:55 Stock Farm Food Company. Somewhere the three moving picture films made about then of Dan Patch racing may still exist. In 1907 the problem of how to directly link his stock farm at Savage and his business centers in Minneapolis led M.W. 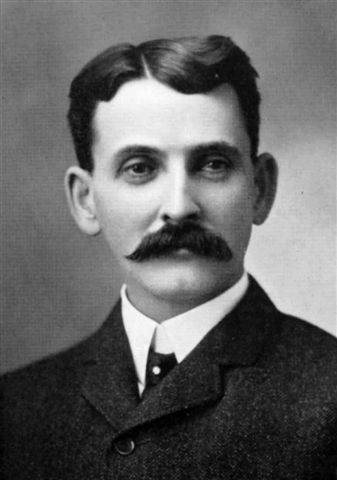 Savage to take over the projected Minneapolis, St. Paul, Rochester and Dubuque Electric Traction Company which he renamed the Dan Patch Electric Line. But that is another story. The famed horse made his last racing appearance on November 25, 1909, at New Orleans. He died July 11, 1916, 20 years old, and with a heart that weighed 9 pounds 2 ounces, as compared with the normal heart of five pounds. Dan had taken sick on July 4th, as had his master, M.W. Savage. Upon being informed of his favorite horse's illness Mr. Savage's own condition worsened and he died just 32 hours after his favorite stallion. 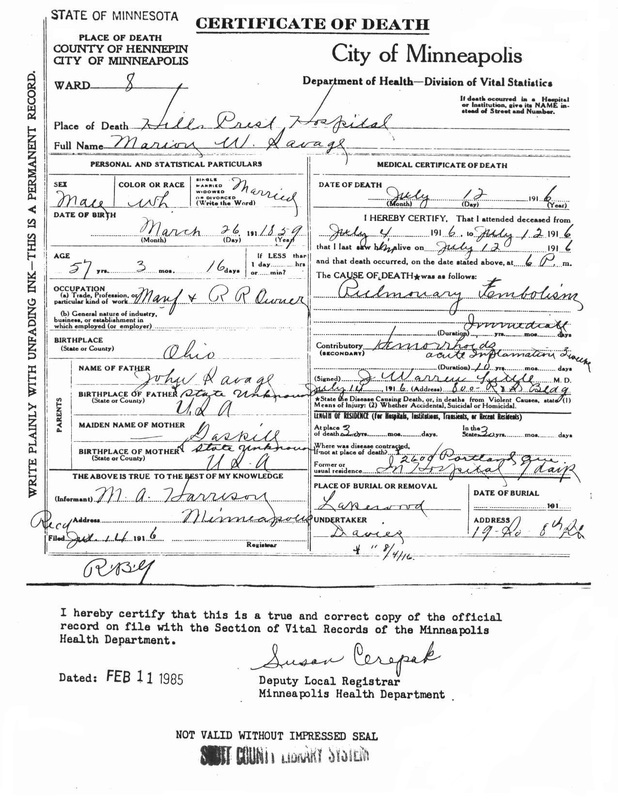 (Death Certificate pictured).